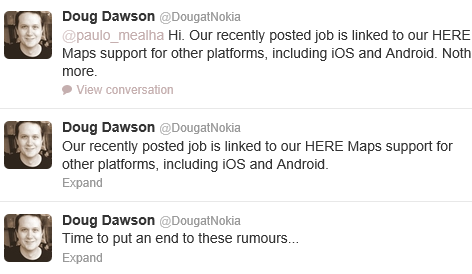 Nokia has recently took to Twitter to officially put an end to uninspired rumors that spurred from a job posting seeking for those who are trained in Linux to help bring the new location mapping service titled HERE . When it comes to the buck stopping, media relations head for Nokia, Doug Dawson has said that it is indeed stopping HERE! He has took to Twitter to defends Nokia’s honor while warding off the evil Android empire and their many mindless drones. Makes for a great film, right? We know… Below are the tweets so that those Android fanboys can now just shutup. Written by: MBGW on December 2, 2012.